I sat pondering in a sacrament meeting one day looking at the table (or altar) on which the emblems of the sacrament, the bread and water, were placed. Both above and below the emblems are a pair of white sheets. I have often heard it said that the white sheets covering the sacramental emblems was to give the impression of the body of Christ on an altar. This always made sense to me because there are numerous references to Jesus Christ as the Lamb of God who gave his own life as an offering for our sins. However on this day my thoughts went down another road. The modern ordinance that we call the ‘sacrament’ used to be something else before the atonement. Since Adam and throughout the era where the Law of Moses was in effect, that table or altar used to be an edifice where animals were slain and consumed by fire. We have in our modern ordinances emblems that represent the flesh and blood of a sacrificial victim, and an altar on which they are placed, but what are these white linens covering the emblems? What do they represent? I began to wonder if it was possible that the white cloth could be a representation of the fire that enveloped the sacrificial emblems. Deuteronomy 4:24 – For the Lord thy God is a consuming fire, even a jealous God. Hebrews 12:29 – For our God is a consuming fire. Exodus 24:17 – And the sight of the glory of the Lord was like devouring fire on the top of the mount in the eyes of the children of Israel. Doctrine and Covenants 130:77 – But they reside in the presence of God, on a globe like a sea of glass and fire, where all things for their glory are manifest, past, present, and future, and are continually before the Lord. Deuteronomy 5:24 – And ye said, Behold, the Lord our God hath shewed us his glory and his greatness, and we have heard his voice out of the midst of the fire: we have seen this day that God doth talk with man, and he liveth. Isaiah 10:16 – Therefore shall the Lord, the Lord of hosts, send among his fat ones leanness; and under his glory he shall kindle a burning like the burning of a fire. Fire: Frequently the symbol of God’s presence, revealed either in mercy or in judgment (1) of his glory (Ex. 13:21–22; Ezek. 1:4, 13; 10:6–7; Dan. 7:9; 10:6); (2) of his holiness (Deut. 4:24; Heb. 12:29); (3) of his presence to protect (2 Kgs. 6:17; Zech. 2:5); (4) of his judgments (Isa. 66:15–16; Zech. 13:9; Mal. 3:2; 1 Cor. 3:13); (5) the punishment of the wicked (Matt. 18:9; 25:41; Mark 9:43–48; Rev. 19:20; 20:10, 14–15; 21:8); (6) of the Holy Spirit as a purifying agent (Matt. 3:11; Luke 3:16); as tongues of fire (Acts 2:3). On the altar there was a perpetual fire, replenished with wood every morning (Lev. 6:12; 9:24; 2 Chr. 7:1, 3), which consumed the burnt sacrifice and the incense offering. Note how when fire is mentioned we often have the word ‘glory’ appearing right along with it. The Bible Dictionary states that fire is a symbol of God’s presence and of his glory. It makes sense because any time we hear of an angel or messenger being sent from the presence of God they are arrayed in glory and in white garments. Revelation 7:14 – …These are they which came out of great tribulation, and have washed their robes, and made them white in the blood of the Lamb. Revelation 19:14 – And the armies which were in heaven followed him upon white horses, clothed in fine linen, white and clean. Year-round the high priest during the time of the Law of Moses would wear a rather colorful array of eight articles of clothing. The ordinary priests would wear white garments consisting of only four articles. The only exception to these standards were on the Day of Atonement where the high priest would wear only four white garments: a white turban, white robe, white pants and a linen belt around his waist. 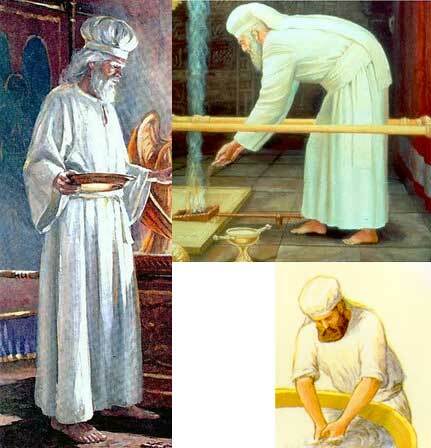 In Exodus 28:22, Moses is commanded to make special garments for Aaron for ‘glory’ and beauty. …It is not the human glory and splendor of Aaron that the vestments are intended to display; it is the glory and splendor of God. The high priest must wear vestments that reflect the glory and splendor of God, as he is God’s appointed human ambassador to our world. 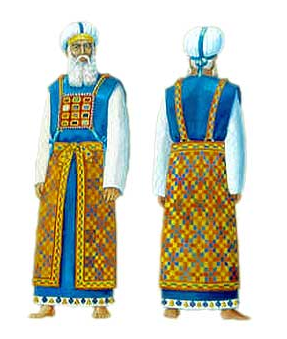 In Rabbi Weisz’s interpretation, he has the the white and gold-containing vestments symbolizing the splendor and glory of God, respectively. In the LDS faith, white cloth plays an important part in almost every ordinance of the gospel that we participate in. When we are baptized, both the person being baptized and the initiate are arrayed in pure white garments. During the sacrament white cloth is placed under and over the emblems of the ordinance; even the priests, teachers and deacons that officiate are instructed to where a white shirt as they administer the ordinance. When one attends the holy temple, a person first receives the garment of the holy priesthood, a white garment, during an ordinance known as the initiatory. This garment is a representation of the garment given to Adam and Eve when they were cast out from the garden of Eden. Among other things, it was a reminder of where they came from and probably an indicator of a future resurrection and glory that they would be ‘clothed’ with. The ordinance known as the Endowment also features the use of white vestments as part of the instruction. The veil of the temple that one passes through for entrance into the Celestial Room is also made of white cloth. When a husband and wife are sealed together via the ordinance of Celestial marriage they are also wearing white. It is interesting to think of how the use of white cloth in each of these cases can be representative of fire and the glory of God resting upon individuals, emblems or between sacred spaces. The presence of white cloth in religious worship seems to be a physical representation of the presence and glory of God that we are seeking to be reconciled unto. The daily wearing of the garment of the holy priesthood by both male and female endowed members of the church is a reminder to us that the glory of God will always rest upon us if we will but live worthy for it. Just as Adam and Eve left the ‘first temple’ or the Garden of Eden with a garment that reminded them of their covenants and promises there, so also we enter and depart from the temple with a reminder of sacred covenants that will allow us to return to the presence of God after the time of our mortal probation has past. Thanks for your thoughts. You might also consider Matt 6 vs 25-30. Christ asks the people at the sermon on the mount to not consider what they shall put on b/c God will clothe them. “Clothe” in this case was translated from the Greek “enduo”. The Master then goes on to suggest that those who God clothes or endows will be more glorious than Solomon. Great insight! “Enduo” is a great word and it is always interesting to see where it is being used in the New Testament. It’s usage in this verse is where the words “put on” occur: “For as many of you as have been baptized into Christ have put on Christ.” – Galatians 3:27. Considering the resurrection, the ideas behind “putting on” Christ like a “garment” are interesting to explore, nothing is greater than to be clothed with resurrection! The instance you mentioned in the Sermon on the Mount(ain) is even more significant when you consider that some consider that sermon a “temple text”. You’d probably love John W. Welch’s presentation “The Temple in the Sermon on the Mount and the Gospel of Matthew”.